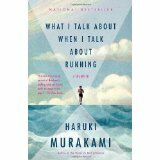 Haruki Murakami’s What I Talk About When I Talk About Running is a lot of things, but first and foremost it is a series of personal essays documenting a writer’s training program leading up to the New York City Marathon. It is a memoir, chronicling the life of a former smoker and bar owner, novelist, professor and runner. It is a memory of one man’s journey from Athens to Marathon. It is running as a metaphor for writing and writing as a metaphor for running. It is a beautiful story about aging gracefully. It is a sad and heartwarming story of the inherent tragedy of an aging athlete. This book was lovingly crafted by Murakami to tell a very intimate story about his own life, his own experiences, and his own struggles with a very personal sport. I related to some parts and found myself inspired by others. The fluid storytelling, the beautiful imagery, and the painstakingly detailed physicality were all so incredibly written that I was engaged from the first words, and didn’t let up until the last. One note – I would not recommend listening to this book. The narrator was great, but Murakami jumps around so often in his personal timeline that I found it hard to keep up, and had no easy way to reference the When. Obviously for me, this did not detract immensely from the book, but it was enough that towards the end I was a little frustrated.